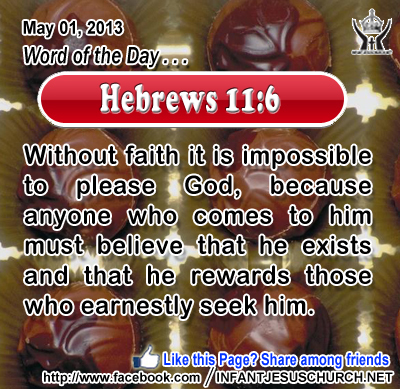 Hebrews 11:6: Without faith it is impossible to please God, because anyone who comes to him must believe that he exists and that he rewards those who earnestly seek him. Heavenly Father, we thank you for your steadfast love and enduring faithfulness. We thank you for your grace and mercy. We thank you for your might and power. We thank you for your awesome holiness. We thank you for being you, and choosing to reveal yourself to mortals like us. Through Infant Jesus we pray. Amen. 1"I am the true vine, and my Father is the vinedresser. 2 Every branch of mine that bears no fruit, he takes away, and every branch that does bear fruit he prunes, that it may bear more fruit. 3 You are already made clean by the word which I have spoken to you. 4 Abide in me, and I in you. As the branch cannot bear fruit by itself, unless it abides in the vine, neither can you, unless you abide in me. 5 I am the vine, you are the branches. He who abides in me, and I in him, he it is that bears much fruit, for apart from me you can do nothing. 6 If a man does not abide in me, he is cast forth as a branch and withers; and the branches are gathered, thrown into the fire and burned. 7 If you abide in me, and my words abide in you, ask whatever you will, and it shall be done for you. 8 By this my Father is glorified, that you bear much fruit, and so prove to be my disciples. Jesus offers true life the abundant life which comes from God and which results in great abundance. The vinedresser must carefully prune the vine before it can bear high-quality fruit. Vines characteristically have two kinds of branches those which abide fruit and those which don’t. The non-bearing branches must be cautiously pruned back in order for the vine to conserve its strength for bearing good fruit. Jesus used this image to describe the kind of life he make in those who are united with him the fruit of “righteousness, peace, and joy in the Holy Spirit”. There is a simple truth here: We are either fruit-bearing or non-fruit-bearing. There is no in-between. But the bearing of healthy fruit needs drastic pruning. The Lord promises that we will bear much fruit if we abide in him and allow him to cleanse us. Loving Infant Jesus, may we be one with you in all that we say and do. Draw us close that we may glorify you and bear fruit for your kingdom. Inflame our heart with your love and remove from it anything that would make us ineffective or unfruitful in loving and serving you as we all.